Well! I know February is a short month but did anyone else think that flew by?! 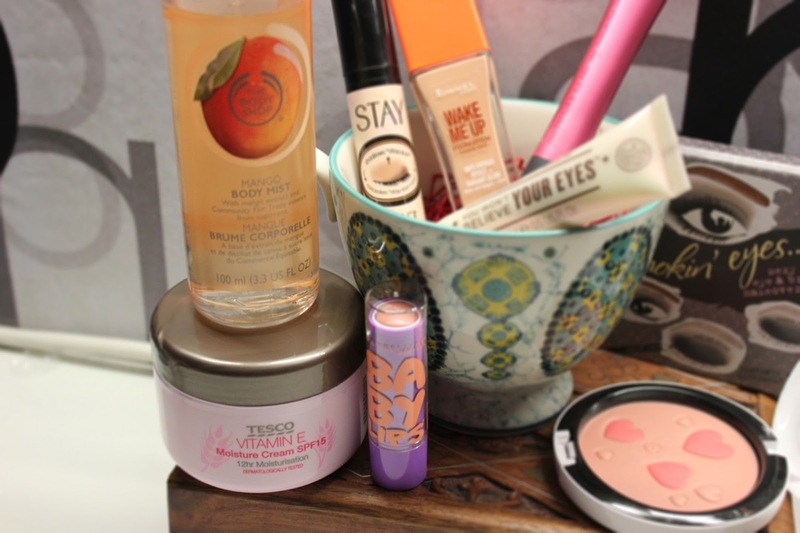 Feels like only yesterday I was pondering over January’s favourites! There’s quite a few this month, and I’m also going to be a non-beauty favourites tomorrow (branching out a bit, I know) so buckle up, because I’m going to whiz through these and then get back to Uni work, since my deadline is 9.30 Friday morning. 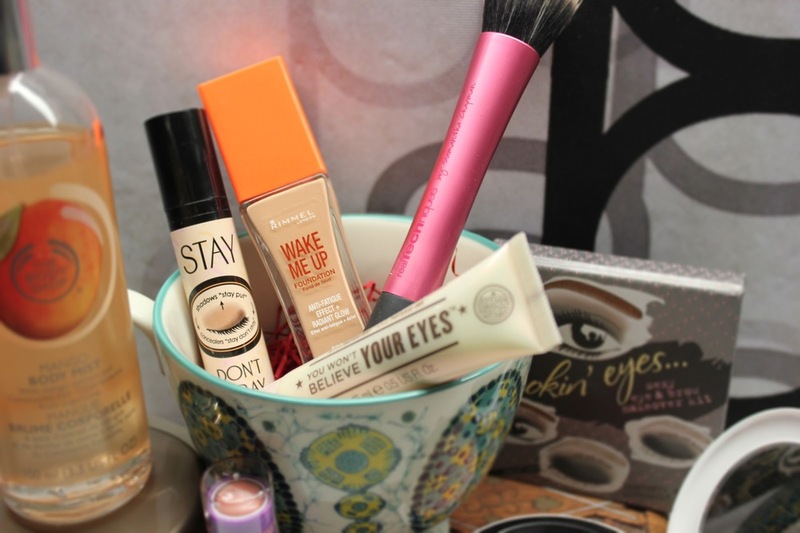 Rimmel’s Wake Me Up foundation was an obvious choice, you can read my full review of it here. I’ve used it everyday since I bought it. No regrets! I’m absolutely enraptured with Benefit’s Stay Don’t Stray, it’s my favourite primer EVER. I’ve actually been known to dab it on any redder areas of skin under my foundation, because it’s just that good. I would smother my face in this if it wasn’t too expensive. I mentioned this briefly here when I got it, but I will do a full review soon! I finally treated myself to the Real Techniques Stippling Brush using my Boots points this month, and it’s love, full review coming soon! As for the You Won’t Believe Your Eyes, by Soap and Glory, I love the thick, creamy formula, and how refreshing the metal application balls make it. I put this on every morning without fail, and it perks up my under eyes quite nicely! I feel like eyebrow pencil can make your brows look very artificial, my perfect answer to that is the Benefit Brow-Zings wax, which along with the shadows in this Benefit Smokin’ Eyes palette, I have used every day! Again I mentioned this briefly here, but I will do a full review soon. I new that the MAC Archie’s Girls Pearlmatte Powder was going to be the love of my life before I got it, and I wasn’t wrong. I love everything about this, and you can read my thoughts here. Sometimes, I’m just not in the mood for a strong perfume, so I turn to my Body Shop Mango Body Mist. I spritz this a few times in the air in front of me, and walk through, so it’s not too heavy whilst still smelling good. I love this fragrance, it reminds me of summer, and wakes me up when I need a little extra go in the morning. I have a review of this and a couple of other products in this range coming soon, but I just couldn’t miss out my new Tesco Vitamin E Moisturiser. It’s an amazing dupe for the Body Shop equivalent, and it’s a snippet of the price! I’ve been using this while my skin needs a little extra TLC with this horrible weather, and my skin feels super healthy! I can’t find the online link for this product but it’s available in most larger stores and it’s about £1.50! I finally got my hands on some Baby Lips when my mum and dad came back from Vegas this month and I’m obsessed! My mumma picked shade 30 Peach Kiss, since I love everything peach. This lip balm now lives in my handbag, it’s moisturising, gives a sheer goldy, glittery colour, and smells just like skittles. I’ve heard a few rumours that these will finally be coming to the UK, I can feel a spending spree coming on, I’d love to try the cherry one! So there we have it, my favourites for this month! Have you guys tried any of these products? 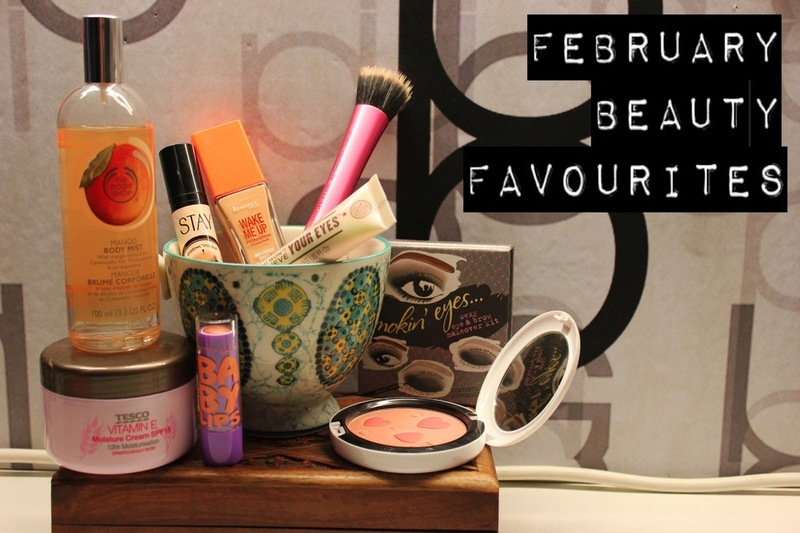 Link me to your February Favourites, I love reading them!